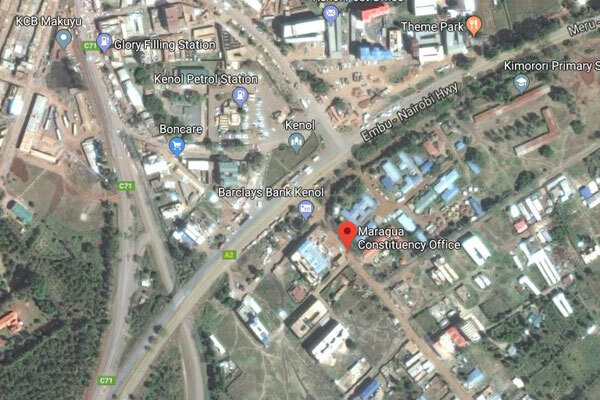 A man and his wife from Methi village in Maragua Constituency of Murang’a County died after the woman set their house on fire following a row. Their three-year-old daughter is nursing serious burns at the Kenyatta National Hospital, Nairobi. According to Beth Nyambura, grandmother of Daniel Mwangi, 23, he and his wife Dorris Miriam, 19, had been having disagreements over a period of time and she had been trying to reconcile them to no avail. Ms Nyambura said she heard the two quarrel on Saturday at about 8pm but after one hour, there was silence and she thought they had solved their differences. However, at about 2am, she heard Mr Mwangi screaming, asking his wife where she had kept the keys. “When I went out, I saw huge flames coming from the house and I desperately started calling for help from my neighbours,” said Ms Nyambura amid tears. By the time neighbours responded to her distress call, the fire was too big and had destroyed everything in the one-bedroom house, said the granny. However, the man, his wife and their child were taken to Thika Level Five Hospital and were later transferred to Kenyatta National Hospital. Ms Nyambura said they received the news that Mr Mwangi and his wife died at 2am and 3am respectively. The distressed granny said the child is still recuperating although they were informed that she had serious burns. Neighbours have called on the government and well-wishers to assist in paying for the child’s medical bills since the extended family is unable to raise the money. A neighbour, Mr Esther Wangui, said from the look of things, the girl will be in hospital for long. “The child may need specialised treatment and the family is not able to meet her requirements, we urge the government and well-wishers to chip in and help,” she said. Murang’a South OCPD John Onditi confirmed the incident and urged families to solve their disputes in accordance with the law. Mr Onditi said they had received the reports that the woman had been vowing to end her husband’s and child’s lives due to family problems. “We are investigating to know why the woman decided to kill herself and her husband,” he said. Dear Bae,will you marry me? Couple dies after wife sets house on fire in Maragua Reviewed by samrack on January 27, 2018 .